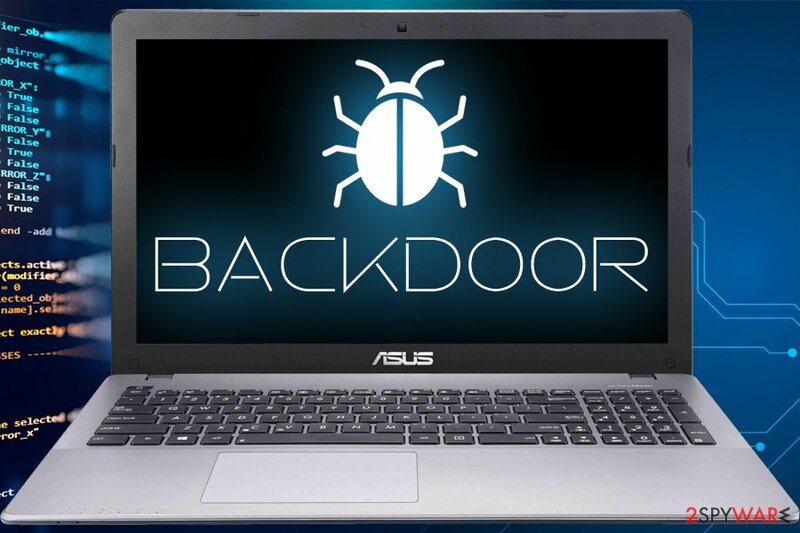 A backdoor is a malicious computer program that is used to provide the attacker with unauthorized remote access to a compromised PC system by exploiting security vulnerabilities. A Backdoor works in the background and hides from the user. It is very similar to other malware viruses and, therefore, it is quite difficult to detect. A backdoor is one of the most dangerous parasite types, as it allows hackers to perform any possible actions on a compromised computer. The attacker can use a backdoor to spy on a user, manage his/her files, install additional software or dangerous scripts, control the entire PC system and attack other hosts. Quite often, a backdoor has additional destructive capabilities, such as keystroke logging, screenshot capture, file infection, andencryption. Such parasite is a combination of different privacy and security threats, which works on its own and doesn’t require to be controlled at all. Most backdoors are malicious programs that must be somehow installed to a computer. Nevertheless, some parasites do not require the installation, as their files are already integrated into software that is running on a remote host. Programmers sometimes leave such backdoors in their software for diagnostics and troubleshooting purposes. However, hackers use these flaws to break into the system. Generally speaking, backdoors are specific trojans, viruses, keyloggers, spyware and remote administration tools. They work in the same manner as mentioned viral applications do. However, their functions and payload are much more complex and dangerous, so they are grouped into one particular category. In order to propagate, backdoor requires users' intervention. The most of such parasites must be manually installed in a bundle with other software. There are four major ways how these threats get into the system. Unaware PC users can accidentally install typical backdoors on their computers. They can come attached to the e-mail messages or file-sharing programs. Their authors give them unsuspicious names and trick users into opening or executing such files. Backdoors are often installed by other parasites like viruses, trojans or even spyware. They get into the system without user's knowledge and consent and affect each of users who possess a compromised computer. Some threats can be manually installed by malicious users who have sufficient privileges for the software installation. The small part of backdoors can spread by exploiting remote systems with certain security vulnerabilities. Several backdoors are already integrated into particular applications. Even legitimate programs may have undocumented remote access features. The attacker needs to contact a computer with such software installed to instantly get full unauthorized access to the system or take over control over the certain software. Some backdoors infect a computer by exploiting certain software vulnerabilities. They work similarly to worms and automatically spread without user knowledge. The user cannot notice anything suspicious, as such threats do not display any setup wizards, dialogs or warnings. Widely spread backdoors affect mostly computers running the Microsoft Windows operating system. However, lots of less prevalent parasites are designed to work in different environments, like macOS and Linux. A backdoor allows the attacker to work with an infected computer as with its own PC and use it for various malicious purposes or even criminal activities. In most of the cases, it is really hard to find out who is controlling the parasite. In fact, all backdoors are very difficult to detect. They can violate user privacy for months and even years until the user will notice them. The malware author can use a backdoor to find out everything about the user, obtain and disclose sensitive information like user’s passwords, login names, credit card numbers, exact bank account details, valuable personal documents, contacts, interests, web browsing habits and much more. Furthermore, backdoors can be used for destructive purposes. If the hacker was unable to obtain any valuable and useful information from an infected computer or have already stolen it, he eventually may destroy the entire system in order to wipe out his tracks. This means that all hard disks would be formatted and all the files on them would be unrecoverably erased. Allows the intruder to create, delete, rename, copy or edit any file, execute various commands, change any system settings, alter the Windows registry, run, control and terminate applications, install other software and parasites. Allows the attacker to control computer hardware devices, modify related settings, shutdown or restart a computer at any time. Steals sensitive personal information, valuable documents, passwords, login names, identity details, logs user activity, and tracks web browsing habits. 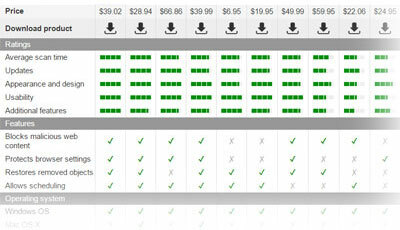 Records keystrokes and captures screenshots. In addition, sends all gathered data to a predefined e-mail address, uploads it to a predetermined FTP server or transfers it through a background Internet connection to a remote host. Infects files, corrupts installed applications and damages the entire system. Distributes infected files to remote computers with certain security vulnerabilities, performs attacks against hacker defined remote hosts. Installs hidden FTP server that can be used by malicious persons for various illegal purposes. Degrades Internet connection speed and overall system performance. Prevents its removal by hiding its files and providing no uninstall feature. There are lots of different backdoors. The following examples illustrate how functional, and extremely dangerous these parasites can be. 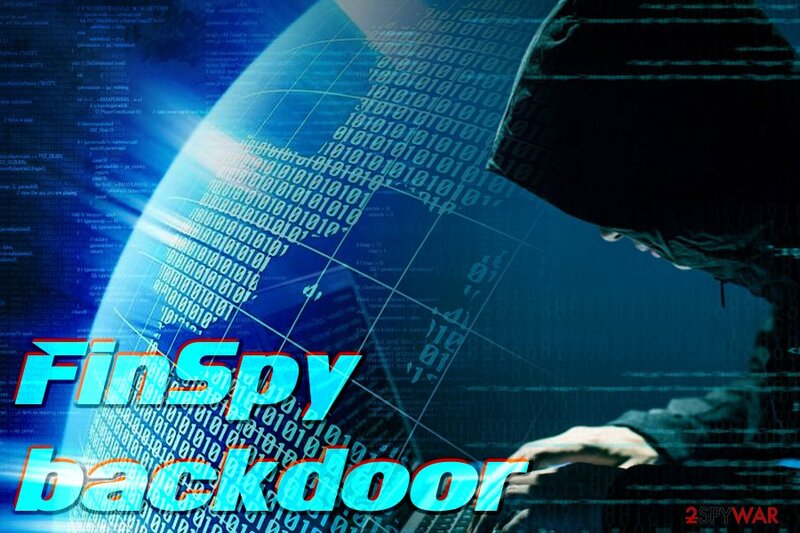 FinSpy , also known as FinFisher, is a backdoor that allows the remote attacker to download and execute arbitrary files from the Internet. The parasite decreases overall system security by changing the default Windows firewall settings and initiating other system changes. FinSpy relies on files that use random names, so it is quite difficult to detect this backdoor and remove it from the system. 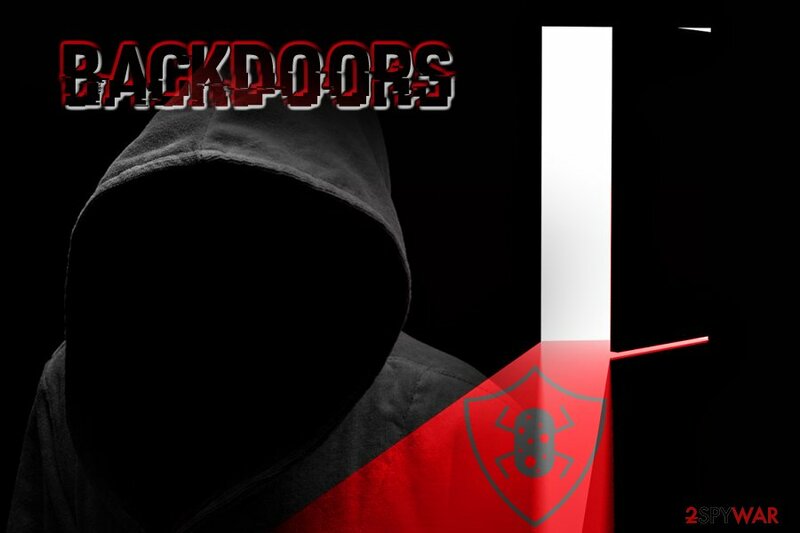 The backdoor automatically runs on every Windows startup, and it can be stopped only with the help of updated anti-spyware. Tixanbot is an extremely dangerous backdoor that gives the remote attacker full unauthorized access to a compromised computer. The intruder can manage the entire system and files, download and install arbitrary applications, update the backdoor, change Internet Explorer default home page, attack remote hosts and obtain system information. Tixanbot terminates running essential system services and security-related processes, closes active spyware removers and deletes registry entries related with firewalls, antivirus, and anti-spyware software in order to prevent them from running on Windows startup. The parasite also blocks access to reputable security-related web resources. Tixanbot can spread. It sends messages with certain links to all MSN contacts. Clicking on such a link downloads and installs the backdoor. Briba is a backdoor that gives the hacker the remote and unauthorized access to an infected computer system. This parasite runs a hidden FTP server, which can be used for downloading, uploading and running malicious software. Briba's activity may result in noticeable instability, computer performance failure, and privacy violation. Backdoors are extremely dangerous parasites that must be removed from the system. You can hardly find or remove a backdoor manually. That's why we highly recommend using the automatic removal option. Many security programs are offered for backdoors removal, although some viruses might require scans using a few different anti-malware tools. AV engines have databases where all the known viruses are included. However, before malware can be added to the database, it needs to be tested in a sandbox environment. Usually, it takes vendors sometime before the new threat is thoroughly examined and added to the databases. For that reason, not all security programs can ensure the detection and removal of all threats. Как да премахна бекдор вируси (вируси "задни врати")?